Translation Nations is part of the big 4 xianxia translation sites on the net. He-Man, the translator for Stellar Transformations had disappeared with no one able to contact him and so Translation Nations was created to finish the translation. Having the series that started the xianxia boom gave Translation Nations a huge leg up and they decided to ambitiously challenge Wuxia World for the #1 position. 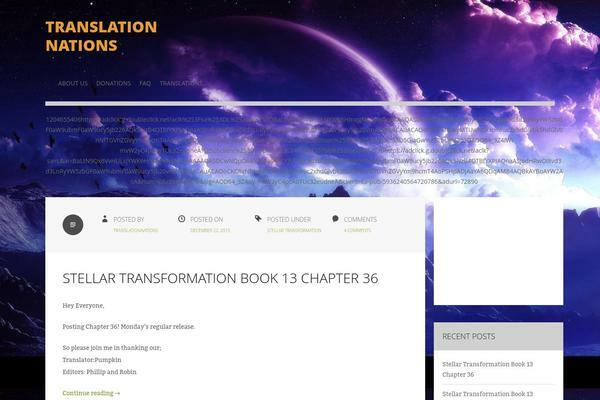 The site started fast managing to get Zebulin, the translator for a popular series called Swallowed Star to join their site and started inviting several other one man translation sites to join them when disaster struck. Internal dissension and disputes almost led to the dissolution of Translation Nations. In the fallout, they lost the translators to Stellar Transformations, the one man translation sites refused to join them and they almost lost Stellar Transformations to Wuxia World when RWX offered to take over the translation. The only thing that saved them was Zebulin stayed and kept up a steady stream of new Swallowed Star chapters. It took a few months before the site managed to get back to having steady releases of chapters. Currently, the site has 4 series that it is releasing and is slowly trying to expand again. The site’s UI is simple but functional. Except when the site almost went under, I have never had any problems with downtime or accessing the chapters. I have never had a problem with the ads or anything else on the site. 500,000 visitors a month, WorthofWeb 917,730. Wuxia World has 3.3 million visitors a month, $90,250,000 value. Gravity Tales has 2 million visitors a month, $2,125,600 value. Shiroyukineko Translations has 525,000 visitors a month, $99,574 value. My favorite series on the site is still Stellar Transformations.